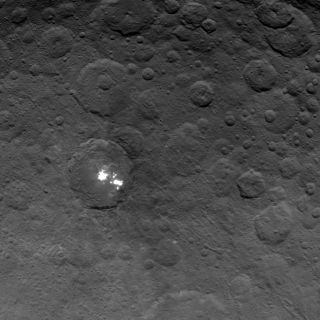 NASA's Dawn spacecraft obtained this image of the brightest spots on dwarf planet Ceres on June 6, 2015, from an altitude of 2,700 miles (4,400 kilometers). Image released June 10, 2015. NASA's Dawn spacecraft has snapped the best-ever images of the dwarf planet Ceres' bright spots, but the strange features still have researchers scratching their heads. The new photos resolve the' bright spots on Ceres into numerous points of varying sizes. The brightest ones lie within a crater about 55 miles (90 kilometers) wide, researchers said. You can see a video tour of Ceres' strange white spots on Space.com that shows how the odd features have come into focus for Dawn over the last two months. A large crater on the dwarf planet Ceres (lower right) is seen in this photo captured by NASA's Dawn spacecraft on June 6, 2015. Dawn captured the images this month from its second mapping orbit of Ceres, an orbit that lies about 2,700 miles (4,400 km) above the surface of the heavily cratered world. But the probe will soon get even closer to the dwarf planet — close enough, perhaps, to take the bright spots' measure at last. "With closer views from the new orbit and multiple view angles, we soon will be better able to determine the nature of this enigmatic phenomenon," Russell said in the same statement. The $473 million Dawn mission launched in September 2007 to study Ceres and Vesta, the two largest objects in the main asteroid belt between Mars and Jupiter. Ceres is about 590 miles (950 km) wide, while Vesta's diameter is 330 miles (530 km). NASA's Dawn spacecraft obtained this image of craters in the northern hemisphere of dwarf planet Ceres on June 6, 2015, from an altitude of 2,700 miles (4,400 kilometers). Image released June 10, 2015. Dawn orbited Vesta from July 2011 through September 2012, when it departed for Ceres. The spacecraft arrived at Ceres this past March, in the process becoming the first probe ever to circle two objects beyond the Earth-moon system, as well as the first to orbit a dwarf planet. The new images from Dawn's second mapping orbit have helped highlight some of the differences between Ceres and Vesta. For example, while both objects have been heavily pockmarked by craters, Ceres bears more evidence of geological activity on its surface, such as flows and landslides, NASA officials said. The same portion of the dwarf planet Ceres' northern hemisphere appears three times, first in black and white (top), then true-color (middle) and finally in infrared to show temperature. Dawn captured these observations of Ceres on May 16, 2015. Dawn is scheduled to continue studying Ceres through June 2016. The probe will make its final observations of the dwarf planet from an extremely close-in orbit, eyeing Ceres from just 230 miles (375 km) away.